Providing you the best range of Fork Type Cable Terminal Ends such as Copper Fork Hook Terminal Ends, Copper Rectangular Fork Terminal Ends and Copper Ring Tongue Terminal Ends with effective & timely delivery. 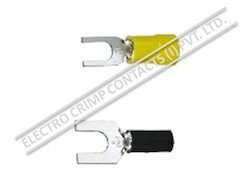 We are engaged in offering a wide range of Insulated Copper Fork Hook Terminal Ends. These products are known for features like robust construction, high tensile strength and durability. Manufactured using premium grade raw material and hi-tech machinery. 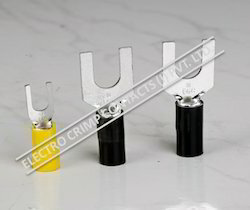 We are engaged in offering a wide range of Insulated Copper Rectangular Fork Terminal Ends. These terminals are fabricated form high graded aluminum materials and hi-tech machinery hence. Our offered range are appreciated for their high performance, durability and reliability. 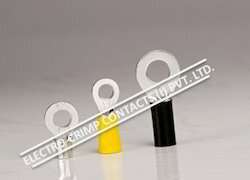 We are a prominent manufacturer of extensive range of superior quality Insulated Copper Ring Tongue Terminal Ends. These products are made using premium quality copper as raw material. We also manufacture these Insulated Copper Ring Terminals in Fork U-cut form. Looking for Fork Type Cable Terminal Ends ?